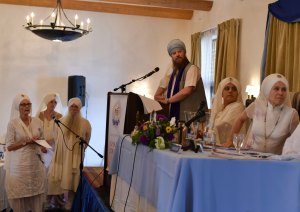 The International Khalsa Council met in Espanola, New Mexico on April 25 – 28th, 2018 for its Baisakhi meetings. 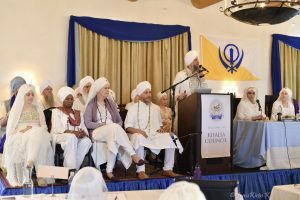 Comprised of approximately 100 Ministers and leaders from the global Sikh Dharma community, the Khalsa Council serves as a leadership body for our Dharma, meeting twice a year to discuss issues of relevance to the present and future of our Dharma. The following are some highlights and updates. 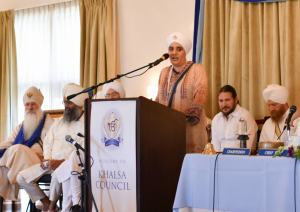 The Khalsa Council elects a new Chairperson every two years. At the April meeting, the members elected SS Dr. Guru Sangat Kaur from Belo Horizante, Brazil, who will begin her term starting in September 2018. The theme for the next two years is Global Presence and Inclusion in our Khalsa Leadership. As a leader from our South American Sangat, we look forward to Guru Sangat Kaur’s skill, radiance and leadership in guiding the agenda and expanding the Khalsa Council’s international outreach and service. We acknowledged and honor our current Chairperson, SS Dr. Harjot Kaur Singh from Calgary, Canada for the extraordinary job she has done as chairperson during the past two years. The grace and dignity with which she guided the meetings were an inspiration to all, and her love of the Guru and her Khalsa spirit shone brightly throughout her 2-year term. How do we build and nurture Sangat across the globe? How do we create accessibility for international members? How do we foster and support global participation in the leadership of our Dharma? How do we increase the international membership of the International Khalsa Council? 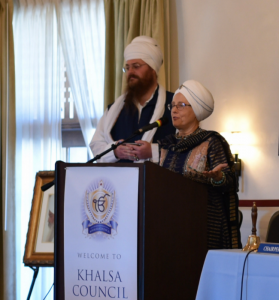 SS Shanti Kaur and SS Sada Sat Simran Singh gave a presentation on the mission and activities of the Dharmic Office of Public Affairs, which includes promoting accurate messaging of the Siri Singh Sahib’s mission and representing the Legacy Organizations. SS Simran Singh has recently joined their team as a volunteer to focus on issues of religious liberty and humanitarian engagement. He regularly attends the International Religious Freedom Roundtable and sits on the Religious Freedom Center Committee. They reported on the success of the Guru Ram Das Chetna Yatra last October in reaching out to the Indian Sangat and they spoke about the upcoming October 2018 Yatra which will coordinate with Camp Miri Piri, which will be held at MPA just prior to the Yatra..
A Yatra in celebration Guru Nanak’s 550th birthday is being planned for November 2019 and will include a Japji Course in Anandpur Sahib. January 5, 2019 marks the 50th Anniversary of 3HO. SS Pritpal Kaur, CEO of 3HO, spoke about the plans throughout the year of 2019 to celebrate this momentous milestone. 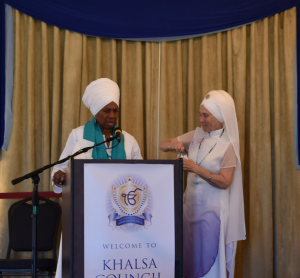 She introduced and honored MSS Krishna Kaur and MSS Guru Singh as some of the earliest students of Yogi Bhajan and 3HO pioneers, and they shared stories and videos of their early days with the Siri Singh Sahib. The members broke into small groups to their share ideas about how to celebrate the 50th anniversary, both in their own communities as well as within our larger international community. These ideas were shared with the larger group. SS Viriam Singh and SS Dukh Niwaran Kaur reported on the work of this task force, which has been meeting on a monthly basis over the past two years. Significant accomplishments have included the creation of a Facebook page which serves as a gathering space for current issues in the LGBTQ+ arena, with a specific focus on how these topics impact Sikh Dharma and the SDI Ministry. The group also created a 4-page briefing which will be updated every 6 months, detailing LGBTQ+ issues from around the world. A Women’s Task Force was established to identify key issues effecting women globally, and how the teachings of the Siri Singh Sahib and Sikh Dharma can uplift and serve women throughout the world. The task force will begin meeting regularly and will report back at the next Khalsa Council meeting. 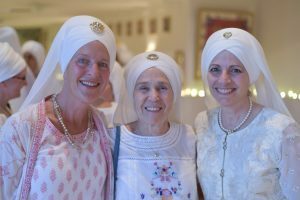 Saraswati Kaur, SDEI, reported on increased enrollment at MPA and the status of a $50K Marketing Grant for MPA, which has funded international events and a website to share the teachings of the Siri Singh Sahib on raising children. She reported on the dealing with the issue of air quality in Amritsar, including installing air filtration and cooling in the classrooms, dorms and other buildings. She announced a one-week Camp Miri Piri at MPA for youth and adults, right before Guru Ram Das Chetna Yatra in October 2018. SS Gurufateh Kaur, Legacy of Yogiji Foundation, reported on The Sacred Collection (as defined by the Siri Singh Sahib). Guru Fateh Kaur assisted with a photo project on Amritsar martyrs for a UK museum making use of the KRI photo archives, is curating a digital collection of Beads of Truth and Yogi Bhajan correspondence and is researching how to create a virtual online museum. She shared that Sadhana Singh continues to wok on the music archiving project. 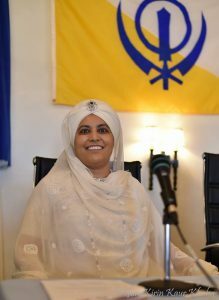 MSS Guruka Singh, SikhNet, shared about the launch of the SikhNet Learning Center with a course co-created with SDI titled Deepening Your Personal Relationship with the Guru. He also shared about the regular meetings of the CEOs of the Legacy Organizations in order to collaborate and mutually support our organizational projects. 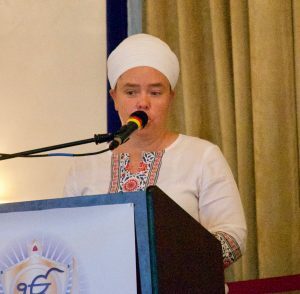 SS Gurujot Kaur, Sikh Dharma International reported on the fully-accredited Japji Course and SDI Academy courses at Summer and Winter Solstice, Camp Miri Piri and Gurdwaras and classes at the Sat Nam Fests. She reported on Minister Enrichment courses and resources. She shared the partnership with SikhNet in launching the first course for the SikhNet Learning Center. She also mentioned translation projects for SDI programs and the expansion of SDI products. MSS Nirvair Singh, Kundalini Research Institute, commented on the revision project for the Aquarian Teacher Manual which MSS Guru Raj Kaur is assisting on. The Aquarian Manual is being translated into at least 14 languages and he noted that there are KRI staff living and working in Brazil and Netherlands, who are working on Kriya write ups (over 3,000) for the Yogi Bhajan Library of Teachings. He also shared that KRI has extended its approval process for small specialty courses. 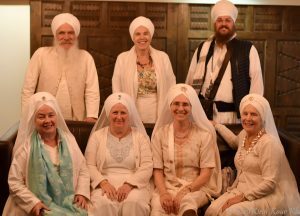 SS Pritpal Kaur, 3HO, shared that 2017 was the largest Winter Solstice ever and that there has been a steady growth in IKYTA membership (17%), due in large part to the International Kundalini Yoga Associations. 3HO is working with East West Tea Company and the Siri Singh Sahib Corporation to hold Peace Prayer Day events and works with KRI on video and photo shoots to assure accuracy. 3HO will be launching a new website in 2019. 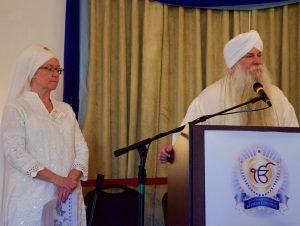 SS Sat Sansar Singh, Chile reported on the official recognition of Sikh Dharma as a religious institution in Chile and Argentina and the work being done in Peru. 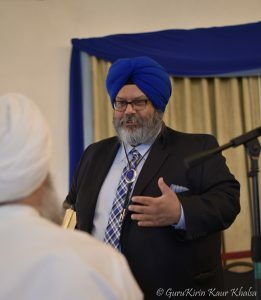 In 2016 Sikh Dharma became a recognized religious entity in Chile, which has allowed Sikh Dharma Chile to participate in interfaith activities including an advisory board to the Chilean president on issues of diversity. He also shared about the recent legal recognition of Sikh Dharma in Argentina and the work currently being done to begin the process in Peru. Sat Sansar Singh acknowledged Khalsa Council members who have visited and taught about Sikh Dharma in Chile, including SS Har Nal Kaur, MSS Hari Dharam Kaur and SS Satkirin Kaur. The “Defining the Electorate Task Force” is a group of Khalsa Council members who have been working together over the past year to develop a proposal for defining the criteria and procedure for the Electorate of future SSSC board members. SS Sahaj Singh has been the facilitator of the task force, and they presented a Motion to the Khalsa Council for consideration. After substantial discussion and debate, it was decided that while there was general support for the direction of the motion, there were still details to be worked out. Valuable feedback was given, and the Task Force will continue to work to provide the clarity necessary for the Khalsa Council at its next session in the Fall meetings. SS Gurujodha Singh, the Board President, introduced the new SSSC board members and announced the officers for the next 2 ½ year term. He was re-elected as President, SS Kulwant Kaur as Vice-President, SS Viriam Singh as Secretary and SS Guru Amrit Singh as Treasurer. He reported on the implementation of business management technologies to increase efficiency and effectiveness, and he mentioned corporate compliance training attended by the Chancellor and the Office of Ethics and Professional Standards. Gurujodha Singh noted four pathways to enter our Dharma: Gurdwara, Yoga teachings, businesses and education at MPA and the need to synergize the four pathways to create spiritual community. SSSC board members traveled during the year to meet members of the international Sangat, visiting various Sangats and events and meeting local political and Sikh leaders. He noted the importance of listening to the concerns of the Sangat in order to better understand the SSSC board’s role in guiding our mission. SS Satwant Singh, the Executive Director of the SSSC, noted the increased productivity of the board and the creative and organizational development skills of the SSSC staff. He reported on Non-Profit board appointments and the standardization of the bylaws of KRI, SikhNet and SDEI, and the work being still being done to finalize the 3HO and SDI bylaws. The SSSC Board works with the Legacy Non-profits and participates in the monthly meetings of the CEOs. The SSSC Board oversees the CCC grant process and administers the funds disbursed to the Non-profits. SSSC directors have been placed on three for-profit boards to support increased communication and interface between the boards. Members of the SSSC board attended various political and interfaith events, including SALDEF events, as well as 3HO and yoga events. He announced the creation of the SSSC newsletter and the SSSC website which has current information about their activities. He requested the Sangat to continue chanting the Aap Sahee Hoaa meditation to help bring resolution to on-going legal issues . Atma Kaur, the SSSC Assistant Executive Director, shared about the SSSC’s work on problem solving and process improvement. She facilitated an interactive activity with the Khalsa Council, using a problem solving technique to exemplify the process the SSSC is using. SS Kulwant Kaur, the Board Vice-President, thanked the Sangat for the honor of selecting her to serve as a board member and shared that she is dedicated to focusing on techniques to optimizing board functioning and is passionate about the relationship between the Sangat and the SSSC board. She announced the new public website (SSSCorp.org). She is focusing on communications through the new site, and via virtual town hall meetings. She welcomes input and connection from Khalsa Council members. Krishan Shiva Singh, KIIT Executive Director, spoke about the KIIT portfolio of companies. There have been major leadership transitions in both Akal Security and East West Tea Company. Akal Security, under the leadership efforts of CEO Sukhwinder Singh, is moving in a very positive direction. East West Tea Company, under the leadership of its new CEO, Giancarlo Marchini, is also experiencing great growth. 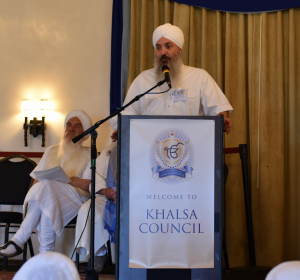 Mehtab Singh Khalsa, the Executive Vice President of Akal shared how the management is focusing its efforts to provide career opportunities that serves our Dharmic community. We are bringing to this effort our radiance and our values. Akal is pursuing business opportunities to maintain stability and to ensure sustainability, including looking at new partnership and service opportunities. Akal supports and funds social programs, including funding and supporting HGRD ashram langar and Food for Kids program. There is also a corporate wellness program for Akal employees and support for charitable organizations in the local community. They have initiated the Akal Foundation to make charitable contributions. Sat Bachan Kaur, Chair of the EWTC board, acknowledged the great work of the EWTC board members and management, and she invited the new CEO of EWTC, Giancarlo Marchini, to speak. Giancarlo Marchini, EWTC CEO, reported on the current activities of EWTC, including a new bottled tea product. He also shared about his journey from a Kundalini yoga student to running Yoga West, and then serving on the EWTC board and now serving as CEO. He expressed his deep gratitude for his Kundalini yoga teachers and mentors. Sat Bir Singh reported on the completion of the new Yogi Tea production facility and shared a video about the construction process of a 190,000 sq. ft. building in west Eugene, Oregon. The Eugene Sangat held Guru Ram Das chanting, recited Sukhmani Sahib and did an Ardas and Hukam in the new facility as building was underway. He thanked all who served to pioneer this company for their projection and shared about the Doing Good program, including support of the global communities who provide tea ingredients. 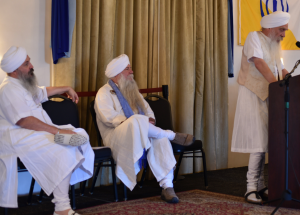 Krishan Shiva Singh gave a brief report on Yoga West, LA which is in its third year of profitability serving the LA yoga community and Sangat. He announced SS Sat Avtar Kaur as the newest board member. Harpreet Singh Mokha, the National Program Manager for Muslim, Arab, Sikh and South Asian Communities for the Community Relations Service of the US Department of Justice, addressed the Khalsa Council with an in-depth report, noting the need for educating public officials about who we are. He stressed how critical it is for the Sikh community to get to know our neighbors, including law enforcement and public officials and also to report hate crimes. He offered Civil Rights and Community Resources to empower us to report and respond to hate crimes against any members of our communities and places of worship. He encouraged members to develop a security policy for all our local Gurdwaras and events. He stressed our need to educate, engage, collaborate, and report. There is a training program offered by the Community Relations Service and he requested that the leadership of the Khalsa Council participate. He hopes that by doing so we can engage in a discussion and become a role model for other Sikh communities. He spoke of the blessing to have been at the US Congress honoring of the Siri Singh Sahib and encouraged us to keep up in our activities and endeavors in continuing to carry out the Siri Singh Sahib’s mission. As Sikhs, we believe in the equality and dignity of all human beings. Sikhs stand for truth, social justice and freedom for all. Honor and protect the right of each human being to live a healthy, happy and fulfilled life. Respect the equality and dignity of all living beings. Welcome and embrace the diversity of all humankind. Honor the dignity, divinity and grace of women. Together we are working towards a more loving, just and peaceful world. Bountiful, Blissful and Beautiful wishes from The International Khalsa Council!